The Holux M-1200 is far superior to the BlueNext BN-909GR. I needed a Bluetooth GPS quickly because of a programming project I've been working on - "LocateMe", and I needed it quick. I purchased the BlueNext from Ebay, primarily because it was cheap ~£20 - and it suffers for it. The device I received whilst newly boxed and unopened had light scratches on its very shiny plastic, in addition the power button didn't seem to work unless it was pressed very hard for around 10 seconds (the manual states 3 if I remember) - more on this later. The performance of the device meant indoors within two metres of a window I got a fix within ~2-3 minutes - that is if the BlueNext didn't switch off of its own accord. The maximum number of satellites I found at any one point was 13 (note this is with my software - which includes satellites that have within the last minute just gone over the horizon out of sight of the GPS). 13 Satellites is quite good - as it should be for a new generation receiver. The manual states that the battery should be initially charged for three hours and that the red light would go out when it was done. Well it did not - after 5 hours I disconnected it. The manual also states that when the battery is low the red light will flash - well it too did not - the device just powered off. Having said this, the battery lasted me around 12 hours of switching on and off. The manual states that the BN-909GR has a powersave functionality that will switch it off if no device connects to it although (if I remember correctly) it states after 10 minutes, not the 2 minutes or less I experienced. Anyhow after using the BlueNext for a few days (remember I was desperate) I found that although the GPS can switch on if you hold the power switch, if you do not hold it long enough the GPS part of it will not switch on - and you just end up with the Bluetooth light by itself flashing. You then need to power it off and back on again to reset it. The Bluetooth functionality also seemed to have fail if the connection was lost - the phone (and my laptop) could not reconnect until I switched the GPS off and on again. Disaster struck two days in - inbetween random disconnects and power offs (usually when it could not get a fix - often after a couple of minutes) the power button broke - it pushed in and snapped inside the case. Being of a technical mind and not having time to claim on the warranty I opened the GPS up and re-soldered a snapped push switch back in place that the plastic part of the case pressed - no problem, in fact it works better now as I no longer have to press so hard. The case is pure plastic - ignore the silver "metal look" finish you may see around the edges, or the unnatural polish and shine you see in the publicity photos - it is shiny, but will likely have light scratches on like mine which you may find really annoying if you are anything like me! On the plus side, the BlueNext also comes with a USB to mini USB power lead and a standard mains power to mini USB lead to charge with. All in all a waste of money and not worth £21 (including postage). Due to the problems with the BlueNext I went back to Ebay and bought the Holux M-1200 "51 channel" receiver for £37 (including postage). The Holux uses a newer chipset (i.e. its got different insides for the non technical :) ) and was a breath of fresh air. From the same distance inside my house it could get a fix literally within ~30 seconds from cold - it really is that fast, leaving the BlueNext to keep attempting and power off after a couple of minutes. The power switch is a rocker type - i.e. you move it left to right, and there is no risk of breaking it from pressing too hard. This is much preferred to the BlueNext's push button. The battery required around 60 minutes to fully charge from new (the power light goes out), and in my first test lasted 5 hours 15 minutes constantly connected to my phone via Bluetooth - not the 8 hours mentioned (but I think this is rated for on "standby" i.e. not connected and streaming GPS data). Regrettably I could not perform this test with the BlueNext because of power save/randomly powering off by itself. The case is made of metal and hardened plastic with a polished front - and my review model had no light scratches. The device is about the same weight as the BlueNext but as it has a smaller form feels more rugged - indeed I dropped it by accident onto concrete and has no scratches to show (it did not land on its face however). The cherry on the cake was how many satellites the Holux M-1200 at its best picked up - 16 - yes 16 satellites. The downside to the Holux is that it only includes a car charging power lead - although it's also possible to charge it using a standard USB to mini-USB lead (i.e. a cable you usually connect a camera or card reader etc. etc. to your PC with). Fortunately for me, because mini USB is a standard the BlueNext's mini-USB mains power and mini-USB leads can charge the Holux! 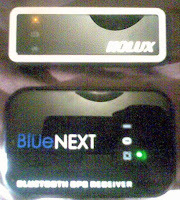 In conclusion it may be that I just had a bad BlueNext receiver, when it did get a fix the device was rock solid - as long as Bluetooth didn't disconnect - and was about on par with most other older GPS, but short of BlueNext contacting me and sending me another one for review I won't be investing in another with my own hard earned cash (and I do need to get another GPS). Kudos to Holux - their product clearly shows the years of experience they have in GPS making and will not leave you disappointed, but they really should try and improve that battery life a little - but this is not a real gripe. The lack of a simple USB charging lead however is penny pinching. If you buy this device you should really ensure you have a mini-USB cable to charge it in the house. Apologies for the poor photo quality shoddy Nokia phone cam because I was in a rush! I too bought one of these from a seller on Ebay, sadly before I saw this article. It arrived yesterday in the post and I charged it as it said to do in the manual. After charging I paired it with my mobile phone and Tomtom software. A few seconds later I had a really good fix and was very happy with the product, BUT after about 5-10 minutes use the device turned itself off and since then it's never let me turn it back on again. The device is totally dead, except the charging light which comes on for a minute or so when charging, so it's a small plastic brick for £20. I am extremely unhappy with this product and reading your article makes me think I am not alone with problems with this device. I am currently seeking a refund or exchange from the seller. You can either take the case off and look inside - the case plastic may not be contacting the rocker(?) switch inside which prevents it coming on. Not a difficult job to solder however. Yes, the Bluenext device has failed on me. I suspect it's the power switch that's the problem as pressing it isn't having any affect on the device, but I can still charge it. I'm really annoyed as it worked perfectly, picking up a GPS signal in seconds from inside my house without being able to see the sky. This power button really lets it down. The seller has offered me a replacement but I've ordered a different bluetooth GPS device now with a hard power button, not soft press. Seems a shame that this device is let down by poor engineering. I now have a Bluenext BN-905GR and this works perfectly. It doesn't look as smart as the 909, but it works just as well (more satalite channels) and has a hard power switch instead of a push button. This doesn't break! So anyone wanting a Bluenext cheapo receiver, take a look at the 905GR, it's much better than the 909.